It's back with a vengeance! Another week of celebrating the best Portland has to offer with the local beer community! Below is a list of events Angelo has planned out! Which ones are you hitting?? Sunday October 21: Killer Beer Summit / Mike Fest @ Roscoe's Pub - 4p.m. It all kicks off at Roscoe's Pub (8105 SE Stark St, Portland, OR) with a gaggle of Mikes and a bunch of great beer worthy of even the utmost of beer SNOBs. Step up to the Mike and explore beers made for and by brewers and craft beer personalities named Mike/Michael/Micah is the central focus of the evening. Look for one-of-a-kind beers from Laurelwood, The Commons, Vertigo, Fort George, Buckman Botanical, Hopworks, and more. Also, Publicans Quyen and Jeremy will be tapping a number of rare one-offs and seasonals with the uber-geeks in mind. Monday October 22: Killer Pumpkin Fest @ The Green Dragon - 4p.m. Returning after being a huge success in its inaugural year in 2011, The Green Dragon Pub (928 SE 9th Ave., Portland, OR) teams up with Brewpublic to present Portland's ultimate pumpkin brew festival. Dozens of tasty gourd-eous beers spanning many base styles will be showcased throughout the pub and in the beer garden. Pumpkin food pairings, games, and pumpkin smashing will also be highlights of this year's Killer Pumpkin Fest. Get your pumpkin fix here for the season! Just across the Columbia River, The New Salmon Creek Brewpub (108 W. Evergreen Blvd., Vancouver, WA) will line their taps with numerous beers from some of Washington State's finest craft breweries. Just moments from Portland city proper, get ready for killer pours of specialty releases from the likes of Black Raven, Naked City, Fremont, Elysian, Walking Man, Mt Tabor, Big Al, Schooner Exact, Boundary Bay, Chuckanut, Ice Harbor, and more! Wednesday October 24: Sean / Shawn / Shaun Fest @ The BeerMongers - 6p.m. It's a celebraSean of sensaShawnAle brewers and craft beer folks who have won our affectShaun with Killer beer! The BeerMongers (1125 SE Division St., Portland, OR) is run by Publican Sean Campbell, so as far as talented Shawns goes, it takes one to know one. We'll feature special releases from Sean/Shawn/Shauns including 10 Barrel, The Commons, Lazy Boy, 21st Amendment, Amnesia, and Georgetown Brewing. Here's your invitaSean! See you there! 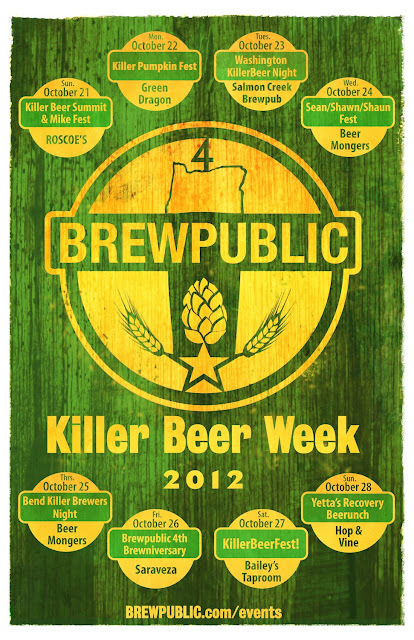 Thursday October 25: Bend Killer Brewers Night @ The BeerMongers - 6p.m. Bend, Oregon is a mecca for craft beer. If you've ever followed the Bend Ale Trail, you understand how awesome this town truly is. For the third time, Brewpublic has teamed up with our friends at The BeerMongers to present Bend Killer Brewers Night. Look for unique and flavorful offerings from some of Central Oregon's finest such as Deschutes, Boneyard, 10 Barrel, Bend Brewing, Silver Moon, Crux Fermentation Project, GoodLife, Cascade Lakes, and more! Friday October 26: BREWPUBLIC's 4th Brewniversary Party! @ Saraveza - 5p.m. Brewpublic raises a glass of craft beer to all who have participated in the Craft Beer Revolution with a lineup of Killer beers from some of our favorite brewers. Hosted by our dear friends at Saraveza Bottle Shop & Pasty Tavern (1004 N. Killingsworth St. Portland, OR), one of the world's finest craft beer establishments, our 4th Brewniversary party will not only be highlighted by spectacular beer, but also with a special video art instillation by The Beer Traveler and beer swag giveaways. Come join us and share a pint and a laugh! Cheers! Saturday October 27: KILLER BEER FEST! @ Bailey's Taproom - 2p.m. The mother of all BREWPUBLIC events is undoubtedly KillerBeerFest! Hosted by our homeskillets at Bailey's Taproom (213 SW Broadway, Portland, OR), a world class craft beer bar, this event will showcase the ultimate of uber-geek offerings ranging many styles, from light and crisp quaffable brews to big and bold barrel-aged behemoths. This installment of KBF will be highlighted by a handful of collaboration beers between some of the best regional breweries and some one-of-a-kind releases. If you've ever been to any of our four previous KillerBeerFests, you know we will bring it strong! Sunday October 28: Yetta's Recovery Beerunch @ The Hop & Vine - 11a.m. Publican, foodie, and beer and wine expert Yetta Vorobik helps resuscitate the wounded livers of KillerBeerWeek with a 5-course beerunch (that's a beer brunch) at her bar and bottle shop The Hop & Vine (1914 N. Killingsworth St., Portland, OR). Yetta and her chef will present pair killer food items with locally brewed specialty craft beers. Meet the brewers from Hopworks, Upright, Breakside, Laurelwood, and The Commons as well as The Hop & Vine's masterchef Sam Reed as they discuss the pairings. There will also be a special beer cocktail Limited tickets available for this intimate event. $35 per person. To make a reservation, call (503) 954-3322.